A friend shared this recipe with me a while ago and I just got around to trying it! And of course I tweaked it. The flavor is amazing! I hope you love the fresh lime and cilantro! Mix together seasonings and season tilapia filets on both sides. Cook the fish over medium heat for about 5 minutes, turn and cook another 4- minutes. You can break the filets into pieces or just slice them down the middle, so one half fits down the center of the tortilla. 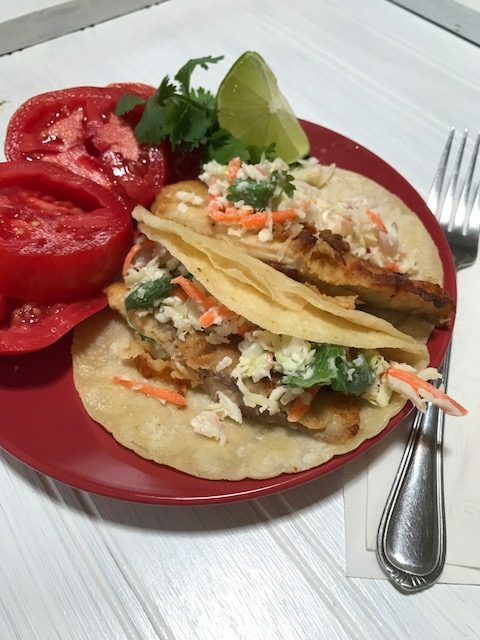 Heat tortillas in a small amount of olive oil and assemble with fish and slaw. Squeeze lime juice on top and garnish with cilantro. If you haven’t ever tried fish tacos, I highly recommend at least a taste. Sure makes for an easy and delicious meal. Ya can’t get any better than fish taco’s .. They are yum, yum , yummy !!! !